This is my very belated thoughts on two books I read at some point towards the end of 2014 and the beginning 2015 (did I say it was very belated). Two books that I am reviewing not because I intend to draw parallels between them, although there could be some - they do cover themes of migration/being a migrant, bring us closer to the psyche of migrants and have multiple characters that are central to the story. I'm sharing my thoughts because I think they are two very beautiful books that cover the theme of (Im)migration (be it trying to get there or what happens once you are there) in their own unique ways. African Titanics is extremely poetic and says a lot in a really short book about migrants journeying across the Mediterranean; while The Maestro, The Magistrate and The Mathematician takes us into the psyche of three very different Zimbabwean immigrants once they have settled in Scotland. African Titanics by Eritrean novelist, Abu Bakr Hamid Kahal, was originally published in Arabic in 2008.Thanks to Darf publishers, we got the English translation (translated by Charis Bredin) in 2014. 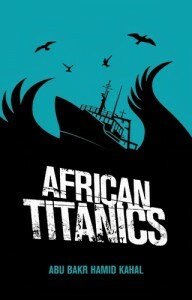 This is a short, but poetic novel about a group of African migrants journey across the Mediterranean. The main character, Abdar - is a young Eritrean man who was 'plucked from Eritrea, swept across the Sudanese border and on into Libya, in the dark night'. In 122 pages we get a sense of not only Abdar, but other migrants' journey - through the desert and across sea - and what happens along the way. The journey isn't cheap - Abdar will require one thousand dollars for passage aboard the Titanic to Lampedusa in Italy. There is also no guarantee of safe arrival on the other side - even with the best captains of the Titanic. The journey to the Titanic is also arduous - in Land Rovers being driven across the desert; lost and thirsty in the desert and hovering between life and death.Then the wait in Tripoli for the few survivors from the desert journey who still want to carry on at the smuggler hide-out. There you learn just how many migrants have passed through this place over the years - their many messages of fear and doubt, in Arabic, French, English, Amharic and Tigré - on the wall as they wait for their own departure on the Titanic. Of Terhas - another Eritrean women whose body was wasted during the desert journey but survived; and young Malouk, the great Liberian storyteller with his faithful companion - his guitar that he has owned since he was fourteen - and his many stories and poems. There's also a treacherous late night border crossing in Tunisia; and the journey across the sea hasn't even begun. This is a perilous journey that these men and women take and without saying it we know that not everyone will make it to Europe. The beauty in African Titanics is that it does not only focus on the extremely dangerous journey that this group of migrants go through, but it also brings out the conversation, music, poetry and stories migrants share with each other as they attempt to get to Europe. Of their hopes and dreams in the midst of despair; and the bravery of men and women who enter these Titanics not knowing whether they will get to the other side or not. This is a beautiful, haunting novel, and while it was first published in 2008, before the height of the crisis gripping Europe - it brings us closer to the humanity of men and women who make the decision to go to Europe. 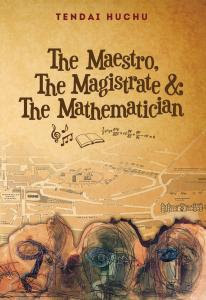 The Maestro, The Magistrate & The Mathematician by Tendai Huchu was first published by 'amaBooks in 2014. This is Huchu's second novel - following The Hairdresser of Harare, and there is humour present throughout the pages of this novel - even if sometimes the topic is quite bleak. One of my favourite parts of the book would have to be his descriptions of Edinburgh - I've been to the city twice and only for a few days. So never enough to really know it, but I got a sense of the terrain and the streets through The Magistrate who wandered the city with his walkman in tow, as he held on to pieces of home through music (guess that's another parallel - music and migration). So who are the Three M's and what's this story all about? Well, it's about three very different Zimbabwean migrants in Edinburgh trying to figure things out, in a certain period in both the UK and Zimbabwe's political and economic history - pre-2010. There's The Magistrate. Baba Chenai who was a big deal in Zimbabwe - a magistrate - but now lives with his wife and their fifteen-year-old daughter. His wife is the main breadwinner, his daughter is growing up (a little too quickly) and he is unemployed, until recently - he got a job as a caregiver in an old persons home - he's trying to come to terms with his new life and identity in Edinburgh with music as his companion as he walks. Then there's The Mathematician, Farai, doing his PhD on some complex topic I can't wrap my head around but it's about hyperinflation - and he has found the work of a deceased Angolan economist who wrote on fiscal policy in Angola whose work he finds quite influential for his own writings. Living with his friends and flatmates, Brian and Scott, Farai seems to be prefer 'slumming' it even though he is wealthy, or at least his family is. He also seems to be conflicted between a longing for Zimbabwe, as well a sense of alienation from it. Finally, there's The Maestro - isolated with his drugs, literature and endless stream of consciousness. A white Zimbabwean, stacking shelves in Tesco - he definitely reveals that you're not spared from the harshness of being an immigrant just because you might be the same race as the indigenes. The Maestro is the most broken, the most fragile, the most alone (internally) of all the immigrants in the story. Then there's a fourth migrant - the infuriating Alfonso - who strange enough grew on me as the story went on; who is connected - loosely or otherwise to these three men. For one, he gives The Magistrate a new purpose in life, through politics, even though initially he is reluctant to take part in any of it. Through these three characters, Huchu captures how frustrating and tiring it can be to find a place to belong once you're far away from home, and the many ways to escape - drugs and books with The Maestro - or be closer to home - music with The Magistrate escapes in his music. Together both African Titanics and The Maestro, The Magistrate & The Mathematician capture the many experiences of (Im)migration from the scorching Sahara to freezing Edinburgh, shaped by hope and despair.